Over the coming weeks we are hoping to introduce you to the team behind the DWA, up first is Paul! Paul Lindoewood is the Founder and the Co-ordinator of Disability in Wales and Africa. He is also a Trustee of the Brecon Molo Community Partnership as well as the Co-Chair of Disability Powys. 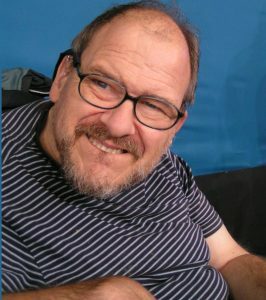 Paul has been involved in the UK Disability Movement since the mid 1980’s and has fulfilled many roles, both employed and voluntarily, developing policy and practices around Independent Living. To enable greater understanding, globally, of the barriers faced by respective disabled communities and how they have been overcome. To promote worldwide solidarity between disabled people. To advocate for disabled people’s organisations to be involved at all levels of social, economic and political development. This led to the birth of Disability in Wales and Africa appearing from the Wales Africa sector.